What a wonderful posting to end 2011. 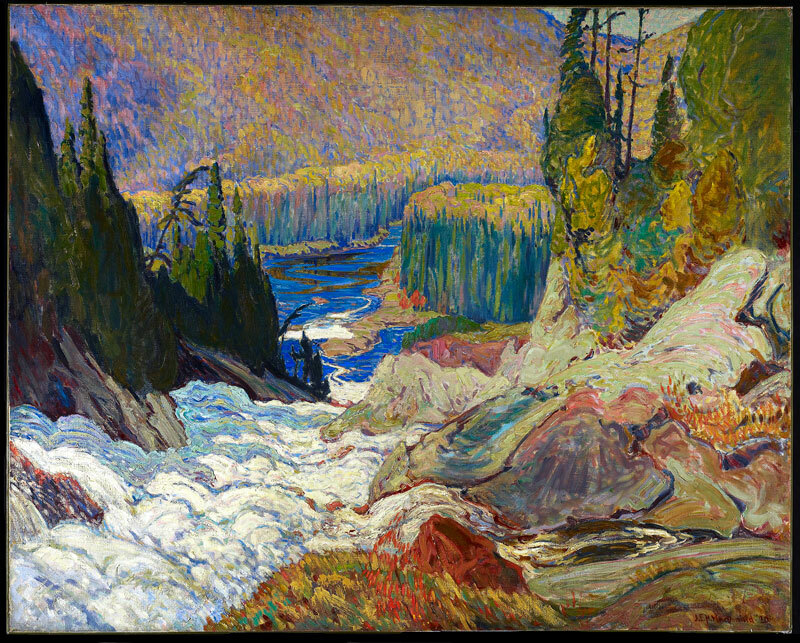 I had no idea how magnificent Tom Thomson and the Group of Seven was. The paintings are sublime, full of light, colour and texture: they perfectly capture the atmosphere of outback Canada. As the curator observes, ‘These artists produced some of the most vibrant and beautiful landscapes of the twentieth century’. I couldn’t agree more. A joy to see, these impressions leave one spellbound. Finally, something delicious in landscape painting! Many thankx to the Dulwich Picture Gallery for allowing me to publish the artwork in the posting. Please click on the photographs for a larger version of the image. “Dulwich Picture Gallery’s Bicentenary year of momentous exhibition fi rsts is to continue in October with Painting Canada: Tom Thomson and the Group of Seven. The exhibition forms part of Dulwich Picture Gallery’s North American series showcasing the work of artists rarely seen in the UK. Painting Canada will feature some of Canada’s most iconic landscape paintings. These bold and exciting works were first celebrated not in Canada, but in London, at the British Empire exhibitions at Wembley in 1924 and 1925. Since then, despite becoming greatly revered in Canada, the work of Thomson and the Group of Seven has been virtually unknown on the international stage. This major exhibition will reintroduce them to the British public, with an astonishing 122 paintings on display as well as Tom Thomson’s sketchbox. Tom Thomson and J. E. H. MacDonald, Arthur Lismer, Frederick Varley, Frank Johnston and Franklin Carmichael met as employees of the design firm Grip Ltd. in Toronto. The other two members of the Group were A. Y. (Alexander Young) Jackson from Montreal and Lawren Harris, effectively the Group’s leader, and a man of considerable personal wealth. They often met at the Arts and Letters Club of Toronto to discuss their opinions and share their art. The artists, sometimes known as the ‘Algonquin Park School’ at this stage, received indirect monetary support from Harris (heir to the Massey-Harris farm machinery fortune) and direct support from Dr. James MacCallum a wealthy Toronto ophthalmologist and colllector. Harris and MacCallum collaborated to build a studio building that opened in 1914 to serve as a meeting and working place for the proposed new Canadian art movement. 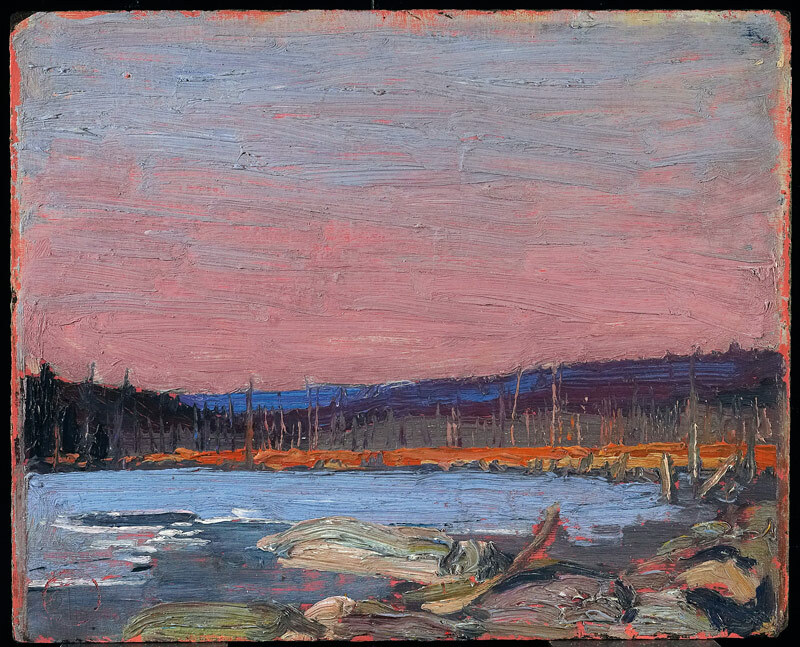 The progress of this informal group of artists was interrupted by the outbreak of World War I and a further severe blow came in 1917 when Thomson died while canoeing in Algonquin Park. The circumstances of his death and subsequent burial have remained mysterious, the source to this day of myriad conspiracy theories. Thomson’s seven artist friends reunited after the war. 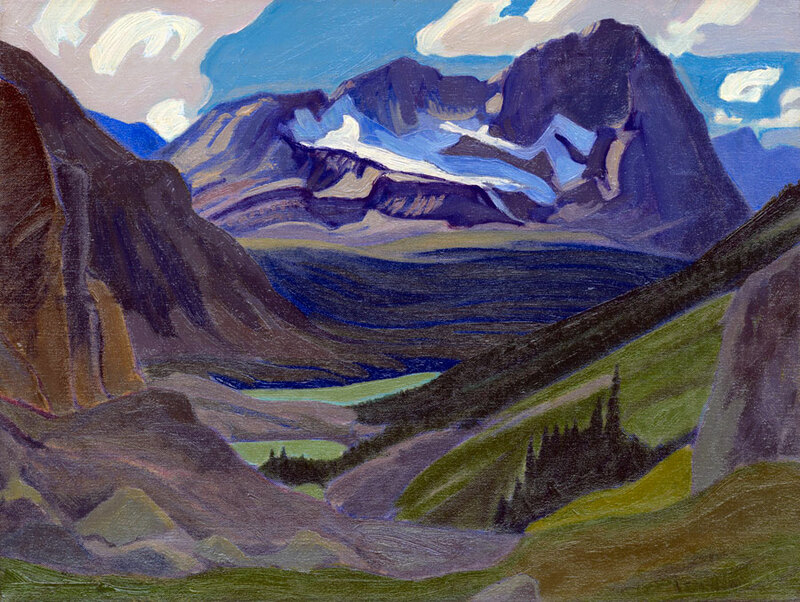 They continued to travel throughout Canada, sketching the landscape and developing techniques to represent such wild and diverse terrain in their art. In 1920 they finally came together as the Group of Seven and held their first exhibition under that name. Prior to this, the art establishment’s view of the Canadian landscape was that it was either unpaintable or too wild and uncouth to be worthy of being painted. 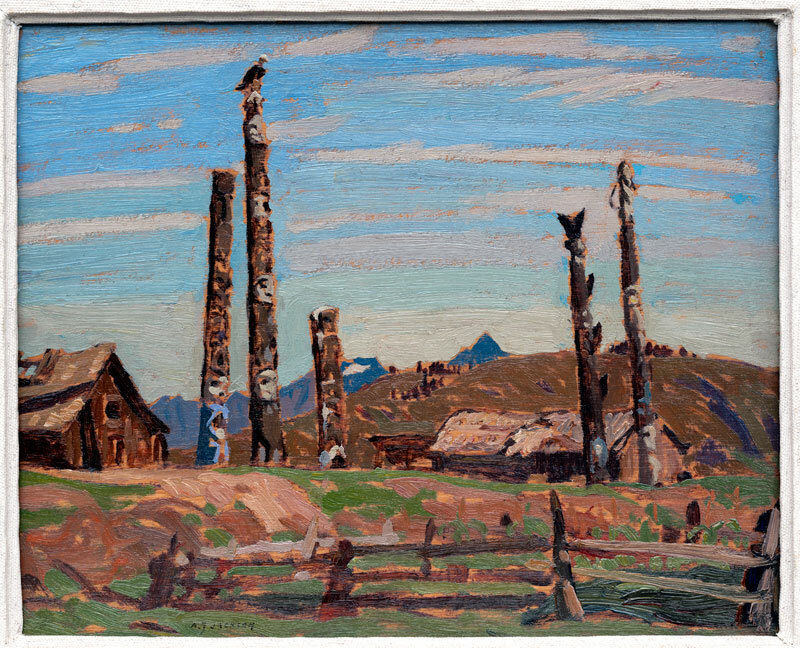 Reviews for the 1920 exhibition were mixed, but as the decade progressed the Group came to be recognised as pioneers of a new, Canadian, school of art. Nowadays, the Group and Tom Thomson are iconic in their native country; every schoolchild is familiar with masterpieces such as Thomson’s The Jack Pine, arguably the most famous and beloved painting in Canada. Dulwich Picture Gallery is proud to partner with the National Gallery of Canada on this exhibition, with generous support of loans also coming from the McMichael Canadian Art Collection, the Art Gallery of Ontario and other lenders. These institutions are lending some of the most famous paintings in Canada. Additionally, a special revelation of the show is provided by the rich group of works to be found in private collections. 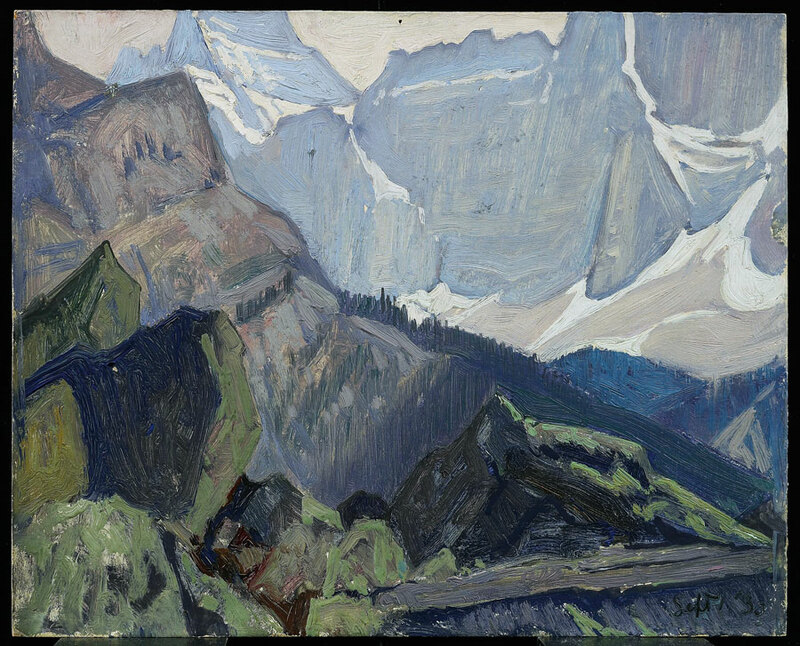 Painting Canada has been planned as a journey through Canada, framed by two grand rooms dedicated individually to Tom Thomson’s electrifying sketches and paintings of Algonquin Park and Lawren Harris’s other-worldly paintings of the Arctic and the Rocky Mountains. Between these two ‘poles’, a selection of the very best work of Thomson and the Group of Seven will be on display. A special feature of the show will be the juxtaposition, wherever possible, of the initial sketch with the finished canvas. One room will in fact be devoted entirely to a display of these vibrant sketches, which represent one of the most impressive contributions of Canada to twentieth-century art. Tom Thomson was born near Claremont, Ontario on 5 August, 1877. A turning point in his life came in 1909 when he joined the staff of Grip Ltd., a prominent Toronto photo-engraving house. The firm’s head designer, artist-poet J.E.H. MacDonald, contributed much to Thomson’s artistic development, sharpening his sense of design. 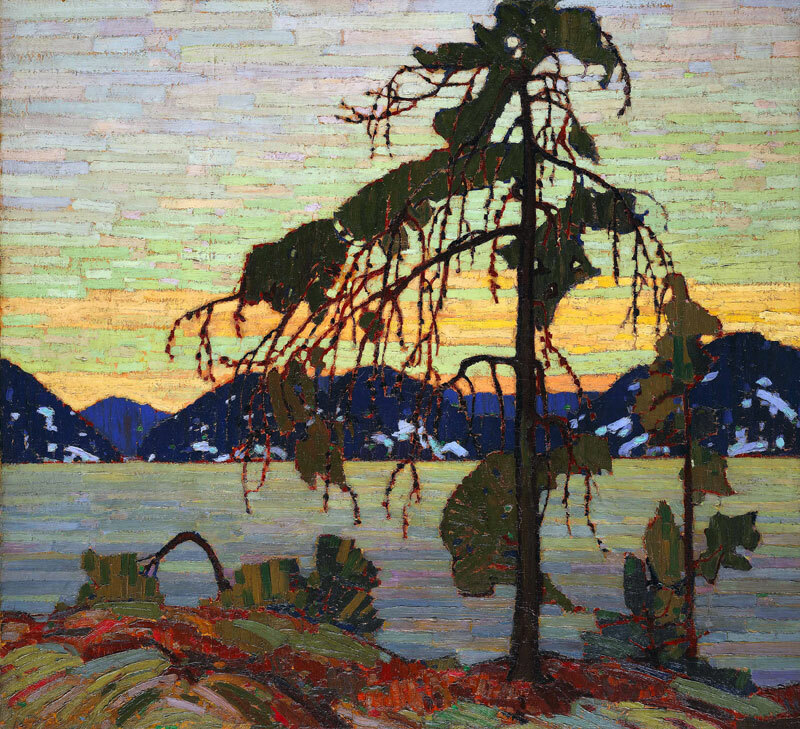 However, Thomson’s career as a fine artist lasted barely four or fi ve years; it was cut short in July 1917, when his canoe was found floating on Canoe Lake, empty. His body surfaced days later, triggering decades of speculation as to his fate. More sensational than these stories, however, was the burst of creativity that had preceded his death. 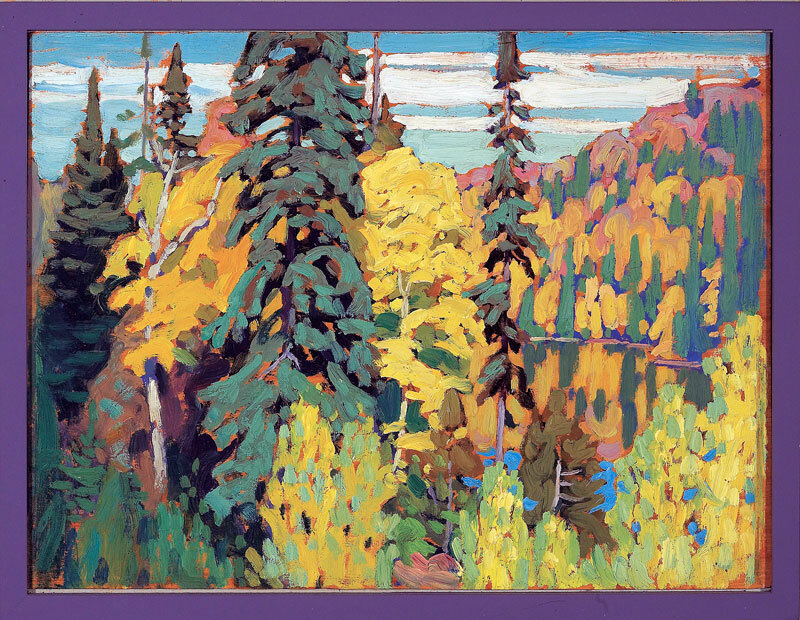 In his last two years, Thomson had developed an artistic language that seemed to capture the unique qualities of the Canadian landscape – painterly, vibrant in colour, in tune with the subtle change of the seasons. The Canadian wilderness had been previously considered too wild and untamed to inspire ‘true’ art. His fellow employees at Grip Ltd. included Arthur Lismer, F.H. Varley, Franklin Carmichael and Frank Johnston – all adventurous young painters who often organised weekend painting trips to the countryside around Toronto. After Tom’s death, a memorial exhibition was arranged and these men, together with Lawren Harris and A. Y. Jackson, would go on to form in 1920 the Group of Seven, probably the most famous artistic force in Canadian art history. 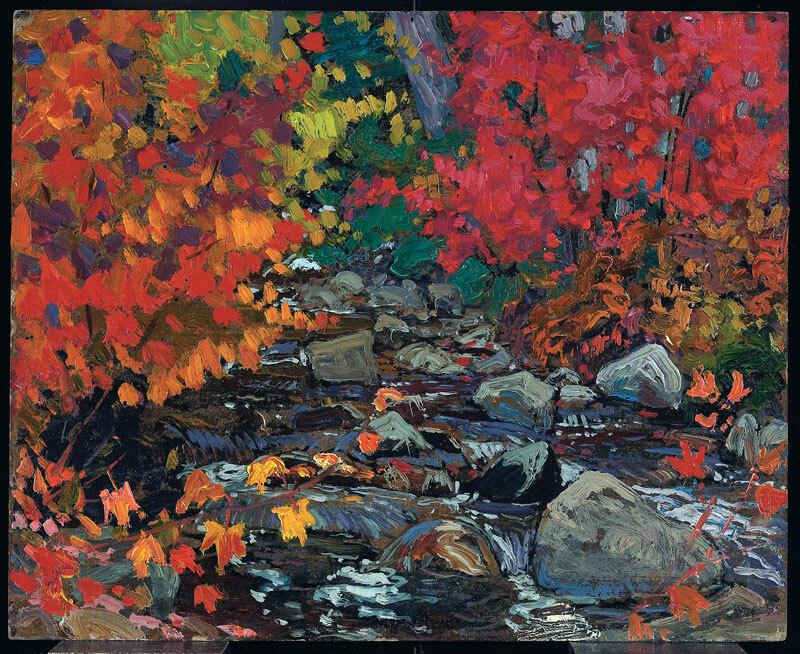 Along with Thomson they created a landscape style that to this day infl uences the way Canadians visualise their own country and their best paintings have become national icons. 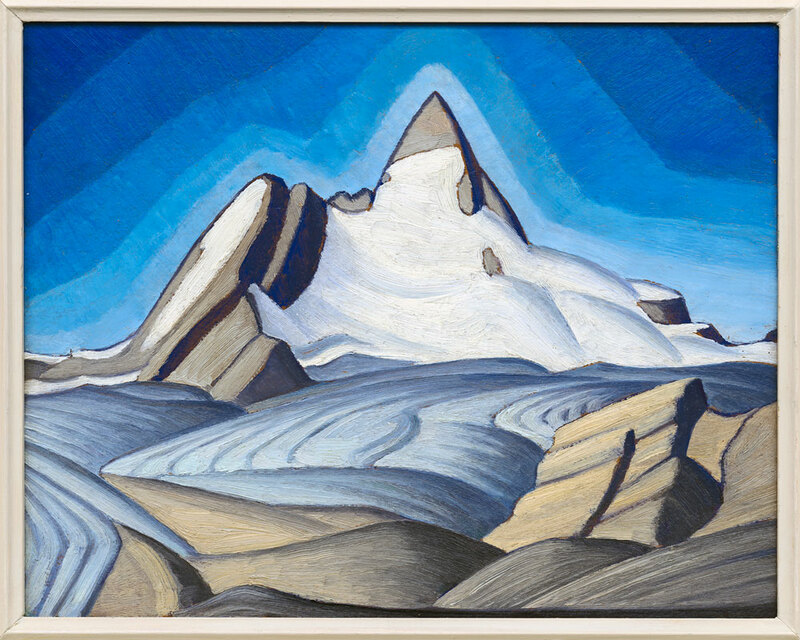 Lawren Harris was born on 23 October 1885, in Brantford, Ontario. He attended St. Andrew’s College in Toronto before studying art in Berlin, Germany, from 1904 to 1908. He then returned to Toronto, where he began painting post-impressionist street scenes of its older and poorer areas. 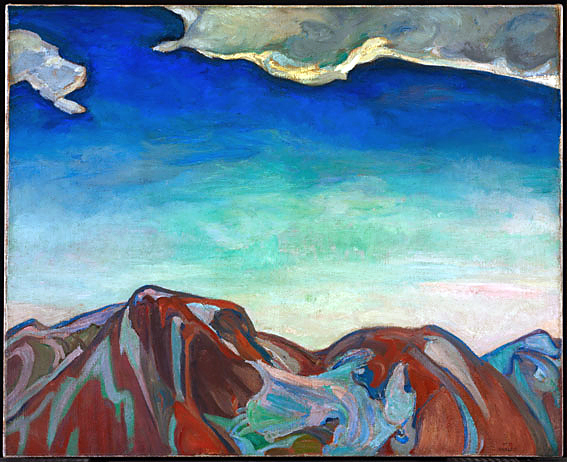 By 1919 Harris’s landscapes had become increasingly sombre and his brush stroke more expressive. 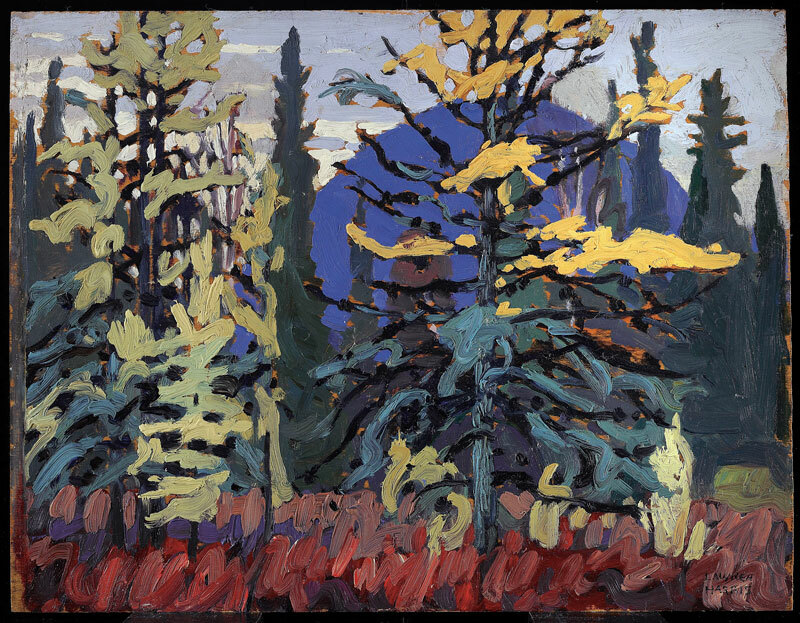 His affection for Scandinavian landscape painting was one of the key factors in the formulation of the Group of Seven’s approach to the Ontario woods, which Harris himself painted with gusto and attention. 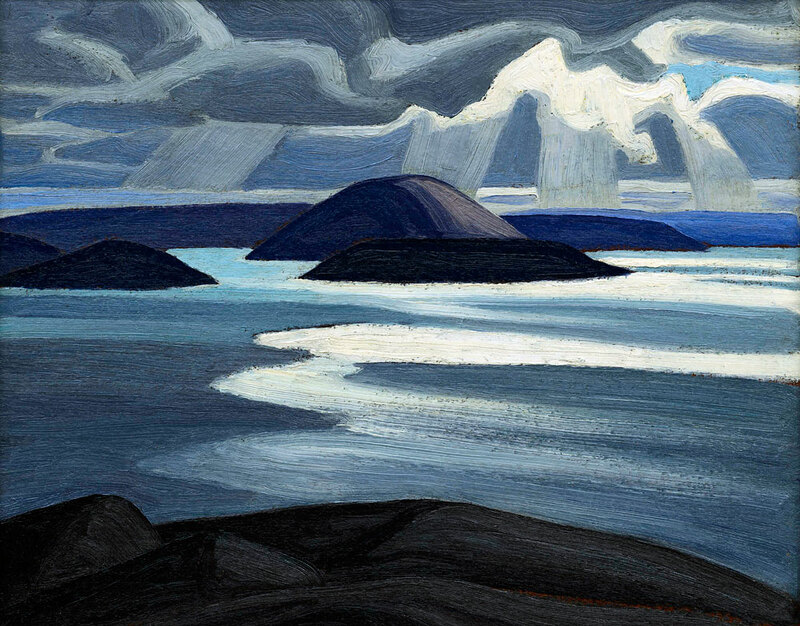 His later style was grandly beautiful and austere, finding its most characteristic subject matter in the awesome landscapes of Lake Superior, the Rockies and the Canadian Arctic. Alexander Young Jackson, or “A. Y.” as he was fondly known, was born in Montreal on 3 October, 1882. Like other members of the Group of Seven he was trained as a commercial artist and for many years made his living by that means. He apprenticed to a Montreal lithographer at the age of 12, and though he later spent two and a half years in France studying painting, he was soon back in Canada paying his rent by designing cigar labels. In the following years after the formation of the Group of Seven he painted the Arctic, the West Coast, the Prairies, and Ontario’s north woods, as well as his beloved St. Lawrence, where his countless sketching expeditions earned him the nickname Père Raquette-Pappa Snowshoe. Arthur Lismer celebrated the powerful beauty of the Canadian landscape in his own expressionist style. His paintings are characterized by vivid colour, deliberately coarse brushwork and a simplified form. Lismer was born in Sheffield, England. At the age of 26, he immigrated to Canada seeking work as a commercial illustrator. It was at Grip Ltd. in Toronto that he met a group of other talented young artists who were to become the Group of Seven. 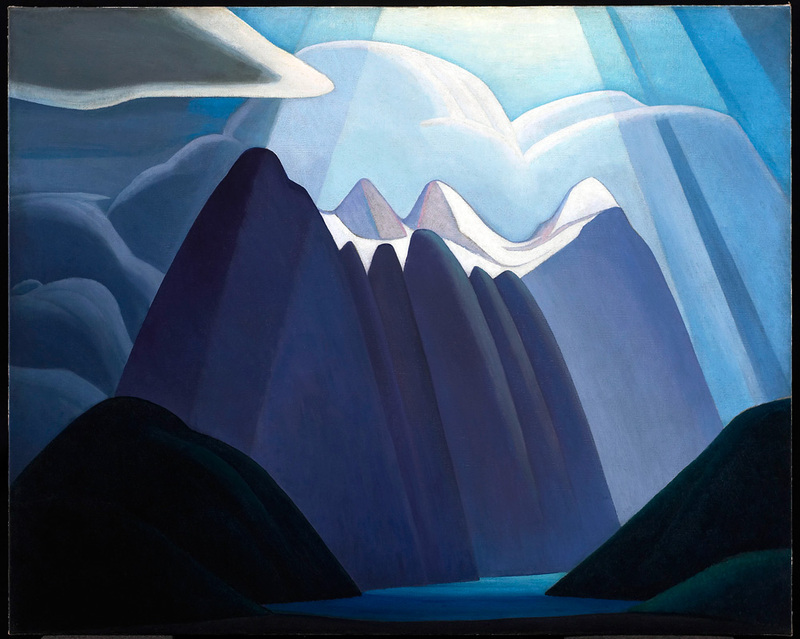 Together, they organized trips to explore and sketch the wilderness – capturing the spirit of Canada in their work, and setting Canadian art on a bold and original new course. Although Lismer painted throughout his life, he devoted the majority of his time to art education. A gifted teacher, Lismer pioneered the field of child art education across Canada and around the world. Varley was born in 1881 in Sheffield, England. He studied painting at Sheffield and Antwerp and went to work in London as a commercial illustrator. 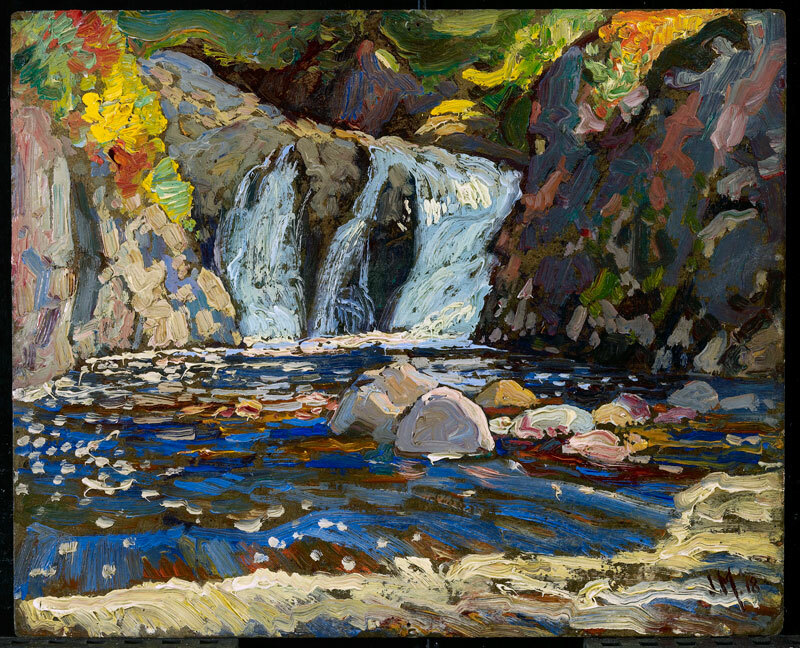 In 1912 he came to Canada, where he found himself working in the same commercial studio as Tom Thomson. 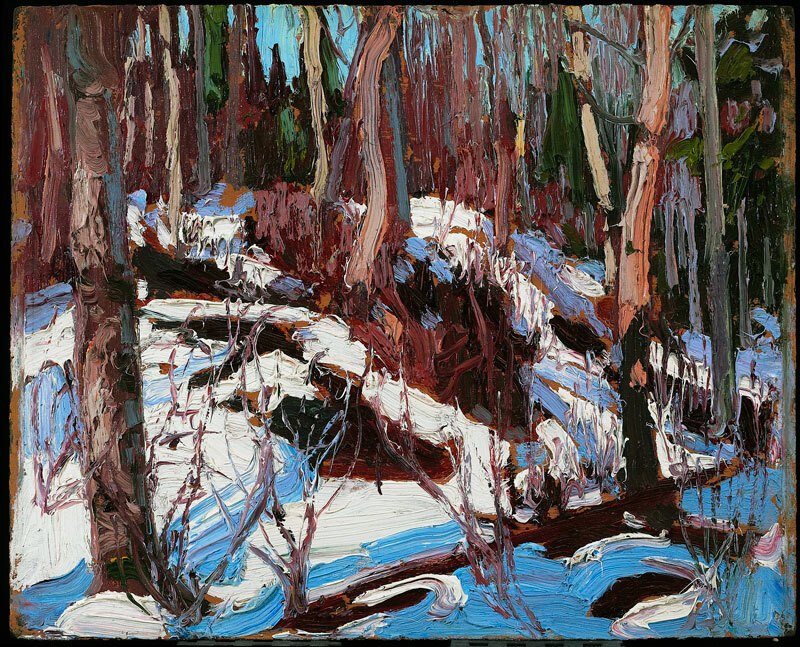 With Thomson and the others he took to painting Northern Ontario landscapes, and also began to do considerable work as a portrait painter. In 1926 Varley moved to Vancouver to become Head of Drawing, Painting & Composition at the newly formed Vancouver School of Decorative & Applied Arts. In 1933 he founded his own school, the British Columbia College of Arts, but this venture led to his bankruptcy in 1935 and by then his marriage had also collapsed. The next years were difficult for Varley, most of them spent suffering from alcoholism in Montreal. In 1945, however, he returned to Toronto and slowly began to work again. He died in Toronto in 1969. Carmichael, the son of a carriage maker, was born in Orillia, Ontario on 4 May, 1890. 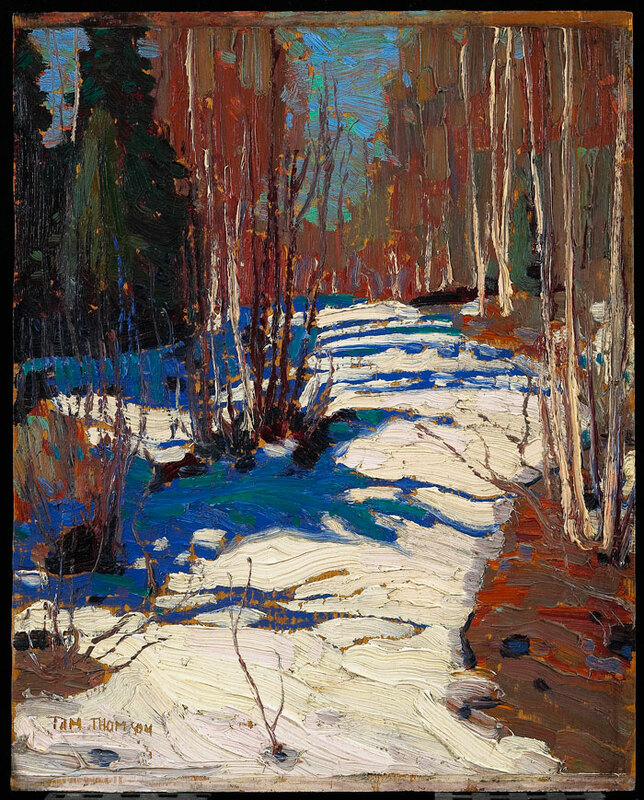 He arrived in Toronto in 1911 with some training in commercial art, and soon found himself the associate of Tom Thomson and a number of other commercial artists who were teaching themselves to be serious painters. In 1913 he went to Antwerp to study painting but was soon back in Ontario to participate in the founding of the Group of Seven, of which he was the youngest member. In 1932 he was appointed Head of Graphic and Commercial Art at the Ontario College of Art. He died in Toronto in 1945. Johnston was an original member but only showed in the Group’s first exhibition. 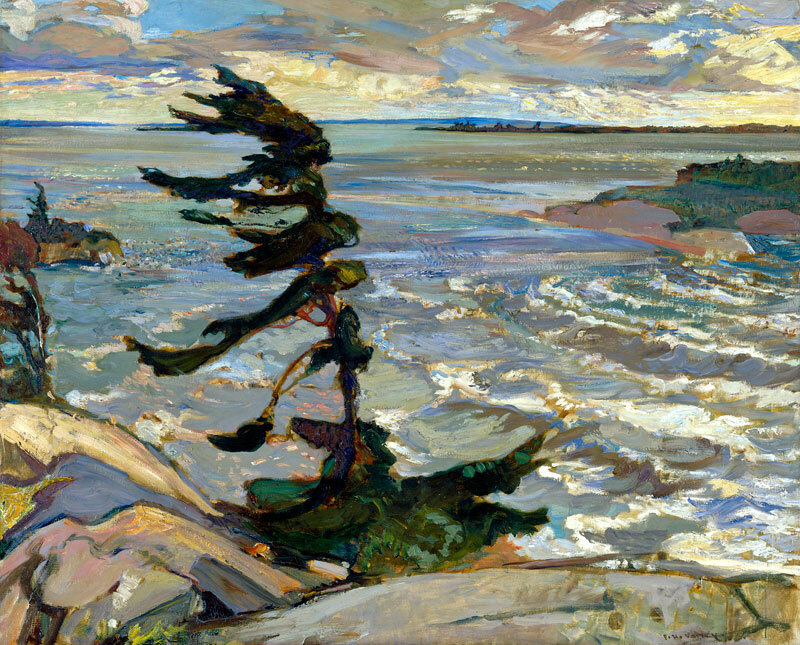 Johnston’s style and technique – he very often painted in tempera – differed from that of the other Group of Seven members. 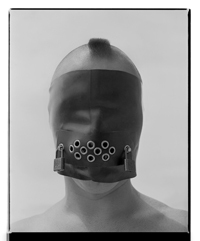 His work was extremely decorative, and sold well – a fact that led to his early departure from the Group, since he felt he could earn more disassociated from the initial critical outrage that greeted the first Group exhibitions. 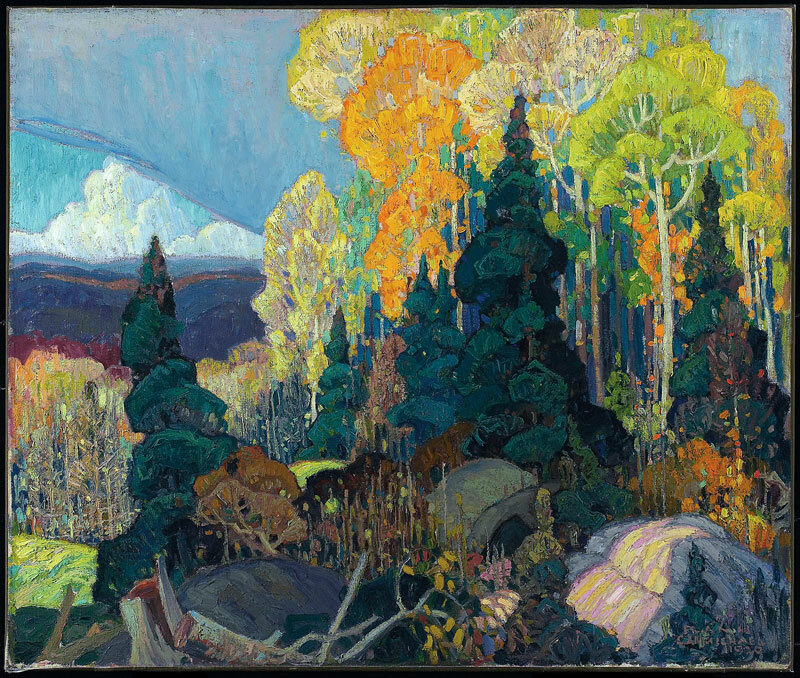 John Edward Hervey MacDonald challenged and vastly broadened the scope of Canadian Art. 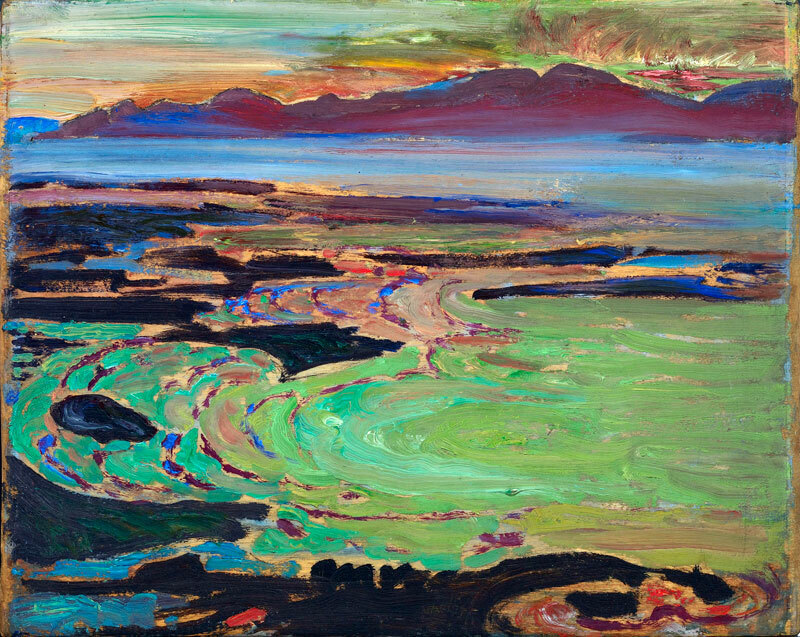 MacDonald believed that art should express the “mood and character and spirit of the country”, and he portrayed his vision in vast panoramas using dark, rich colours and a turbulent patterned style. MacDonald was born in Durham, England, and moved to Canada at the age of fourteen. He trained as an artist in Hamilton and Toronto, pursuing a career in commercial art. 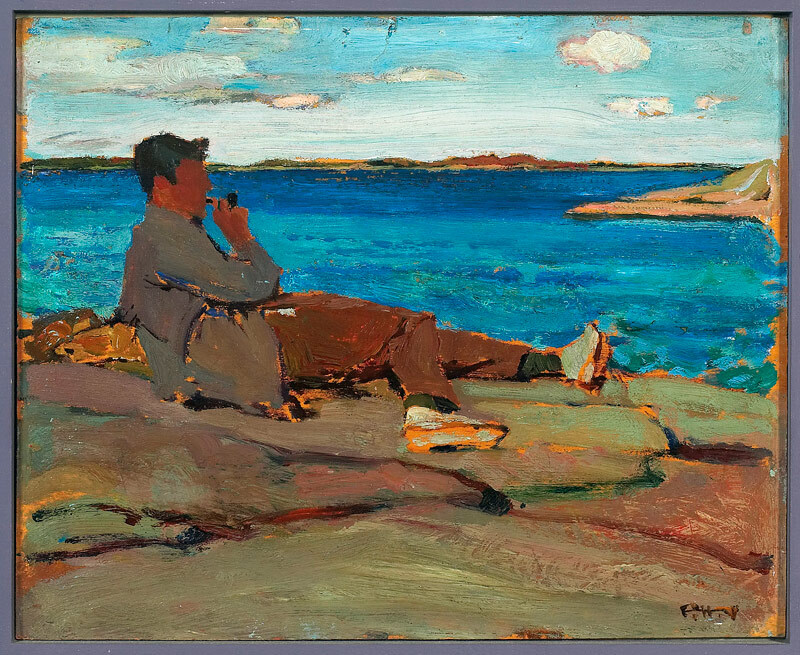 In 1895 he joined Grip Ltd. in Toronto where he met and encouraged other staff members, including Tom Thomson, Frank Carmichael, Arthur Lismer and Fred Varley, to paint with him on weekends – laying the groundwork for what would later become Canada’s famous Group of Seven. He was the oldest member of the Group. His early death led directly to the disbanding of the Group in 1933.